As parents, it’s our job to impart knowledge to our kids that will help them grow up to be productive members of society while caring for their overall health and wellbeing. We know that this is what we’re supposed to do but no one ever said this was easy. I know this challenge well as a mom of a middle school aged daughter who turns 13 in just a couple months (gulp!) and a tween boy who is in his last year of elementary school. These days there is no shortage of age appropriate conversations about important topics, like underage drinking, in our house. Sometimes the conversation begins with one of my kids sharing something a friend said at school, the topic du jour in health class, or a newsworthy tidbit that I’ve heard and know can spark a conversation around the dinner table. As a parent, I know when it’s my job to talk and when I need to stop and listen. The former teacher in me knows that kids need to hear something seven times before it sinks in. This is a challenge when we’re trying to educate our kids about the risks that underage drinking pose to growing brains and bodies at a critical age when they could be exposed to alcohol for the very first time at any time. 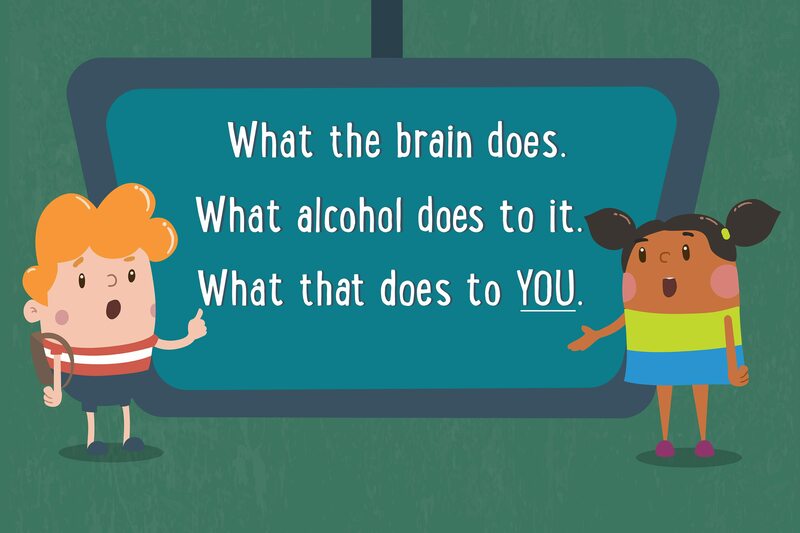 Understanding how kids learn and understanding what my own kids need to be successful has been helpful over the past year as I’ve worked with Responsibility.org to develop a series of animated videos about how alcohol affects the brain. It’s been an exciting project that has required my experience as an educator and parent to create new resources that will be invaluable to families as they have conversations about underage drinking in their own homes. This science-based content is not only available digitally and for free, but Responsibility.org has also made it easy by aligning each lesson to multiple standards, providing a one-stop-shop for teachers on www.asklistenlearn.org, and providing resources for counselors and nurses so they too can feel prepared for any conversation that comes their way. Think back to how you learned about the brain. Chances are it was through a film strip that beeped, a worksheet, or a video that featured a voice that droned on and induced sleep. These days, tweens use Google voice search to look up information and choose a YouTube video as a learning platform before clicking to read an article. The multimedia and video format that Responsibility.org has used for the seven-part animation series will appeal to today’s digital generation. They are just the right length to be easily consumed in a single sitting without being overwhelming. The characters allow tweens to connect with the content and become invested in the outcomes. Designed to be used in the classroom or at home, the series of seven videos provide essential knowledge that will aid kids in their understanding about how the brain works, the functions each part is responsible for, and how each is affected by drinking. Providing concrete knowledge about how alcohol affects each part of the brain through a fun format is important in reaching today’s learners. Animated characters with their own hilarious personalities are combined with age appropriate narration that kids will want pay attention to without feeling like they’re being talked down to. The brain is complex but learning about it doesn’t have to be. Since we know that our kids stop listening to us after a while, our challenge becomes locating resources that can provide them with accurate information that appeals to them. Since the brain videos are available free online and are formatted to fit mobile devices, tweens can watch them on a desktop, tablet, or even on their phones. The brain videos are the newest resource for tweens, teachers, and parents from Ask, Listen, Learn and I hope that you’ll find them helpful in having one of the many conversations with your kids about the risks associated with underage drinking. Leticia Barr, founder of Tech Savvy Mama, a site that assists parents in navigating the ever-changing world of technology, is a member of our Educational Advisory Board, and a wife and mother of two children.